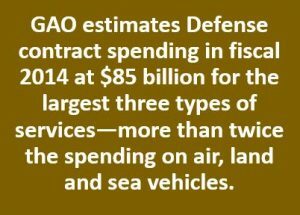 The massive National Defense Authorization Act for fiscal 2018 contained language requiring the Pentagon to provide more detail on its spending plans for $144 billion in services contracts. But in the Trump administration’s fiscal 2019 budget released in February, the document that provides the most comprehensive information on services contracting was missing. The omission was spotted by specialists at the American Federation of Government Employees, who pointed out that last year’s submission carried more detail, while this year’s was limited to an “advisory and assistance services” document with simple line items. Three years ago Washington Technology released a WT Insider Report on the impact of lowest price, technically acceptable contracts. Those results were clear cut – folks hate LPTA. In fact, the report was called LPTA: A hate-hate relationship. Washington Technology found very little redeeming qualities to LPTA. Since that time there has been a lot of talk from the higher reaches of the procurement world that LPTA really should only be used when requirements can be very specifically and narrowly defined. In general, services contracts should not be competed as LPTA. 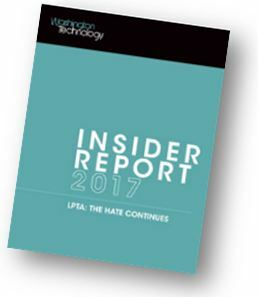 In the past few months, Washington Technology embarked on an update of the 2014 study to see if LPTA was waning as a force in the market place. The news is not good. This latest report is called LPTA: The hate continues. “Anything less is handing a blank check to the Pentagon to waste [money] on contracted services,” wrote national president J. David Cox in a letter urging that Congress require implementation of Government Accountability Office (GAO) recommendations that would establish more detailed long-term projections in spending on such services as information technology, research and development, and facilities maintenance. “This action is needed to ensure that funds are properly allocated to the readiness and recapitalization priorities of the Department of Defense and not diverted to headquarters contracts,” Cox said. 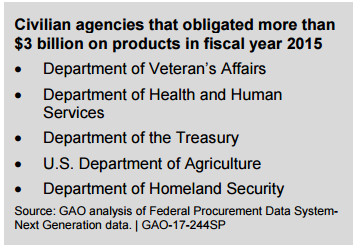 Contractors working with major federal agencies delivered $438 billion in products and services in fiscal 2015, a 24 percent decrease from fiscal 2011, according to a wide-ranging roundup from the Government Accountability Office. 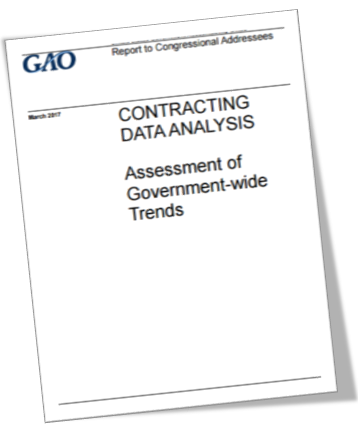 The 66-page report titled “Contracting Data Analysis: Assessment of Government-wide Trends” said the drop-off occurred mostly at the Defense Department, which saw contracting go down by 31 percent in that timeframe. 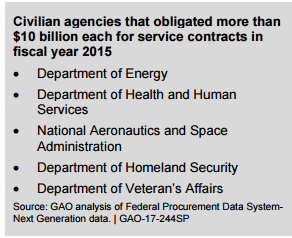 Services contracts have now risen to 60 percent of total government obligations — 50 percent of Pentagon awards and 80 percent of those let by civilian agencies over the past five years, GAO said. Such services as professional and management support to information technology needs were used most by the Air Force and Army, while the top civilian agencies procuring services (worth at least $10 billion) were the departments of Energy, Health and Human Services, NASA, Homeland Security and Veterans Affairs.